Near Lake Tahoe & Virginia City, the perfect place to stop. Enjoy all the games and dining we have to offer. Visit nearby golf courses or relax with some fishing at one of the great fishing spots in the area. Perfect place to park and sleep in Carson City. Easy access from US 395. 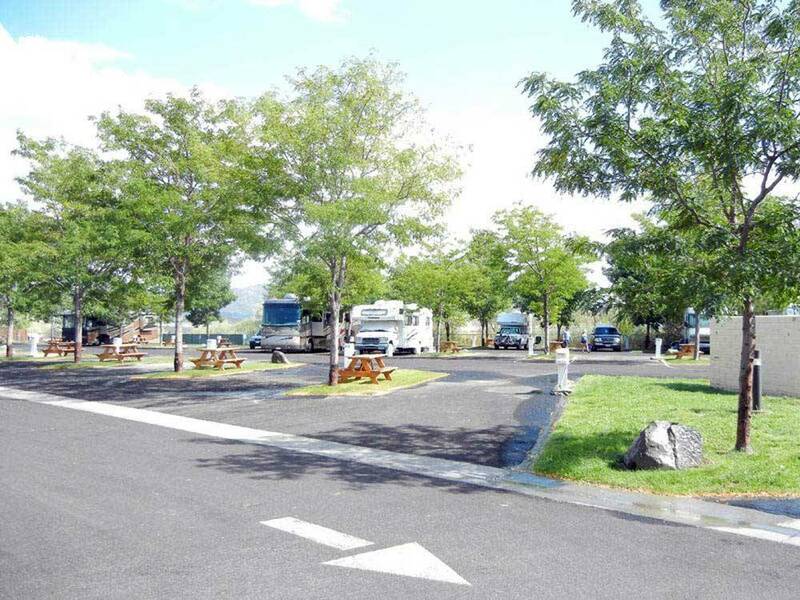 Just the basics—paved pads, full hookups, picnic table, but clean and in good repair. Great restrooms—heated! Small, enclosed dog run. Laundry too, but we did not use it. Casino entertainment and restaurants next door. Reasonably priced with a Good Sam discount (present card at check-in). It’s not a park for relaxing outdoors, and there is background highway noise, but it is perfect for stopovers. Gold Dust West in Carson City, Nevada was our last stop on a 2 week trip through 4 states where we stayed at 7 Good Sam and KOA RV parks. We did not encounter the following concerns in the other 6 parks. We arrived in the late afternoon after a long hot, drive across the Nevada desert only to discover that check-in is at the hotel lobby which is about 100 yards from the entrance to the RV park, through the hotel parking lot. Once inside the hotel, we were served by an officious clerk. I had booked two sites next to each other, 5 months in advance. The spaces we were assigned were one site apart. I was told that they never guarantee sites together. Yet, the space between us remained empty during our stay of one night. Further, I was billed 3 nights ($37, $89 & $89) for a one night stay! When I got home, I called the toll free line, which was not a valid number, to sort out the billing errors at my expense and the phone call was lengthy. The RV spaces are close together. The roads are narrow and difficult to maneuver when arriving and departing. There is not enough room to reasonably park your tow vehicle. Our "pull through sites" were too short to leave our trucks hitched to our trailers. Our site was filthy. I cleaned up trash including a pizza box, paper trash and medical gloves. The pool and amenities are all in the hotel which is at least 100 yards away through the steamy hot parking lot, smelly lobby and smoky casino. As we drove out of Carson City, we saw other parks which are much nicer. Do not be misled by the Good Sam endorsement and the Trip Advisor award of excellence for 2016-2017. This park is not excellent. The picture of this campground is misleading. We highly recommend that you stay in another park. After 9 hours on the road I thought this would be a good break. Turned out that it was, but just for a pit stop if you require hookups. The spots are really small and packed in tightly next to each other. Parking for your tow vehicle or dinghy is possible next to your rig, but you'll be doing so either on your 2 ft strip of paint on the asphalt marking your "yard" or sticking out into the drive. Worst case you can park outside of the RV Park in the adjacent main casino parking area. The RV Park is at the far corner of the hotel parking lot, yet check-in is at the main hotel entrance. Signs are not obvious in terms of checking in -- your best option is to actually pull up where hotel guests check in vs heading to where you'd assume RV check in would be. Good place to stay if you don't want to spend much time in your RV. Very basic park - tightly packed spaces. restrooms and laundry facilities are great. Didn't use the pool because it was inside the casino's hotel. WIFI and cable were good. If you wish to gamble, it's right next to a casino. We stayed here for about a week and enjoyed the park. The sites are a bit tight, but are clearly marked, paved and have grass, trees, and picnic table. Great location to explore Carson city, Reno, and Lake Tahoe. We stayed here in a 40' mh and would definitely stay again. 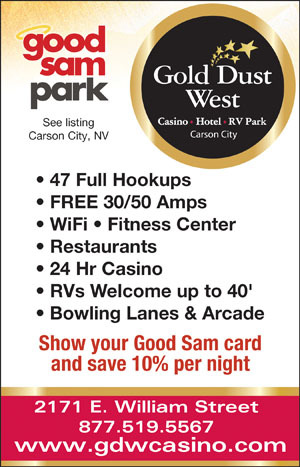 I cannot understand how this rv site has such a high Good Sam rating. The customer service alone should make it no more than a 5 rated park. The size of the narrow roads, the size of the slots for the RV, the big boulders they use, the lack of trimming trees, the lack of knowledge the check in people have in regards to the RV park bring it down. A person parks there rv by the park building then has to walk to the hotel registration to get registered. That alone should be a red flag. They are trained for hotel knowledge not about the park. They have no working knowledge of the park other than their little map. They should at least mention that a person should unhock their tow before entering this very small park. They should also mention about the narrow slots, rocks and trees. They really also need a person to guide a coach to their assigned slot and make certain the roads in are passable to it. I had to ask 2 existing campers to move their vehicles so I could get down the road to the assigned slot. Should have asked a 3rd person but even that may not have helped. The slot assigned could not be pulled into little thru as advertised. Just to narrow with the electrical island and the big boulder on the opposite side. We decided to back into one of the back in sites but they all had tree branches that would scrape our coach. Finally decided to back into the original slot assigned. It was one of the very few with not tree branch issues. The RV manager flatly said they do not trim trees...what kind of service is that????? We later saw another big rig pull in, look at the tree situation and pulled out and left. Would I recommend this part...no.no.no! Would I stay there again...absolutely not. !